The Buckingham Property was constructed in 1924 by the British firm of Armstrong Whitworth and Company. The building has always housed members of the Buckingham family. Warwick Buckingham, the grandson of the first resident, is the current owner. Buckingham Property is an good example of the Arts and Crafts style of architecture that was frequently used in Corner Brook during the 1920s. When the pulp and paper mill was constructed during the early 1920s the company created an entire town to provide accommodation for their employees. Townsite, as the development was known, contained over 175 houses; all of which were designed by Halifax architect Andrew Cobb. The Buckingham Property was classified by Cobb as a type-4rr. The type-4s were the most common of the four main house types designed by Cobb, each type with several variations. The type-4s were rented to skilled tradesmen or foremen working in the mill. Ambrose Buckingham, a superintendent with the mechanical department, and his wife, Georgina, were the first residents of the Buckingham Property. They eventually bought the house in 1955 from Bowater Newfoundland Limited, who were the owners of the mill at the time. Andrew Cobb's design for the Buckingham Property, and all other Townsite houses, was inspired by the Arts and Crafts Movement. The one-and-a-half storey structure has a steeply pitched gable roof; hipped dormers; a covered front porch; and spruce shingle cladding. The house has been restored to its original condition and is an excellent example of the Arts and Crafts Style. The Buckingham Property became a Registered Heritage Structure in October of 1992. The property was awarded the Southcott Award for heritage restoration by the Newfoundland Historic Trust. 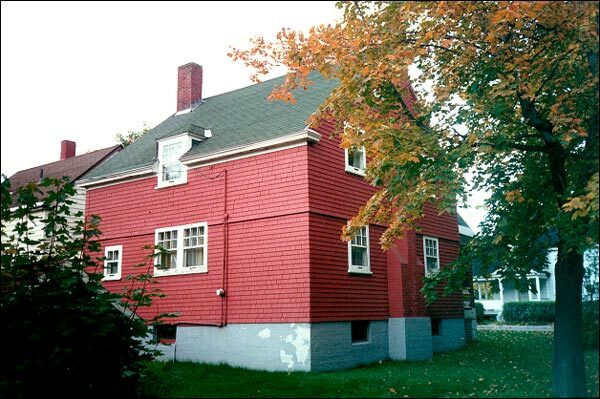 Also view Buckingham Property Registered Heritage Structure on the Heritage Foundation of Newfoundland and Labrador web site. The Newfoundland and Labrador Heritage Web Site has on its site only a portion of the registered heritage structures in Newfoundland and Labrador. To view a complete list or search for a particular structure visit the Heritage Foundation's Property Search page.